With D-Day scheduled for less than two weeks away, more attention had to be given to preparing the day. The Allies needed total command of the air and sea. The 2nd Bomb Division was ordered to attack four German airfields in France that could be used to defend Normandy. Each Bomb Wing was given an airfield. The 14th Wing drew the airdrome at Avord, France. The 492nd dispatched 30 of its ships and crews loaded with incendiary and general purpose bombs. All of the planes attack the target as there were no aborts. By borrowing 644 fighters from the 9th Air Force, the fighter escorts outnumbered the thousand plus heavy bombers put up by the 8th Air Force. The fighter protection was excellent. 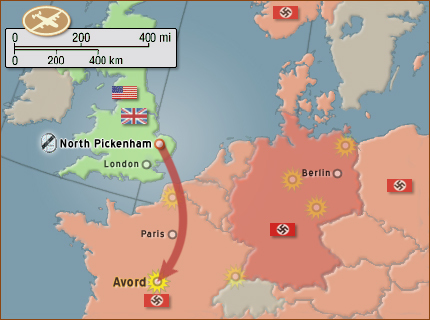 Sgt Heath reported in his dairy that they didn't run into any flak until they went over Paris. Then, he says, they were in it for 45 minutes. The 8th Air Force lost one of its B-24s and two B-17s to flak. Just like the mission before, no German fighters took to the skies in an effort to defend the airfields. Although the 14th Wing had little difficulty locating and bombing their target, Sgt Heath wrote that they (the 492nd) almost missed it. The flak guns encountered on the way to target were still there looking to knock down the Wing on the return trip. Of course, the route home was different enough to be out of range from most of those guns. The Group returned intact without any loss of aircraft or casualties. The targets were important in order to give D-Day a chance to succeed. It was becoming clear that the Allies had achieved air supremacy of the French skies. Future missions would be designed to help maintain it. The crews liked these short runs. It helped build their confidence and increased their chances of surviving. The earlier blood-bath on 19 May was looking like what it was, a day of hard luck.